Depending on what kind of a person you are, choosing gear for a trip can either be fun and interesting, or a painful necessity. 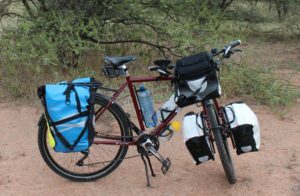 As it turns out, I really enjoyed the planning stages, despite my lack of experience and knowledge of what gear to take on a year-long cycle tour though Africa. This is a list of the gear we used. The comments / reviews reflect our experiences after more than 11,000km of touring with this setup, in all kinds of conditions. 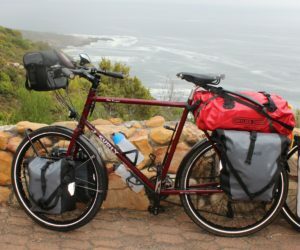 There are no touring bike suppliers in South Africa (although this is slowly changing). If there were, I would most likely have just bought complete bikes. However to import a complete bike is expensive owing to (a) shipping costs and (b) an import duty on complete bikes. So I decided to import the frames (and some of the components), and then have the bikes built up by the excellent Bicycle Maintenance Company in Woodstock. The bikes specifications had to take into account that we would be spending many hours per day on the bikes, that there are not many spares or maintenance skills in Africa (and I am not a great bike mechanic! ), that we would be carrying quite heavy loads, that we would be doing a fair proportion on dirt (unpaved) roads, and that we would occasionally need to load the bikes onto buses, trains or ferries, where they could get manhandled and abused. So: strength before weight, comfort before speed, and as low maintenance as possible. These frames took a real hammering on the trip and never gave any problems. Also solid and comfortable to ride. 8/10. Groupset: Shimano SLX (disc brakes, drivetrain, crankset). Every element of this groupset performed flawlessly with no mechanical breakdowns. We replaced the chain and cluster after around 7,000km. Everything else we used for the whole trip. The slightly cheaper Deore option would probably have been fine as well. 9/10. Great platform pedals, light, strong, good grip and sealed bearings. No problems. 8/10. The only problem we had was a crack in the plastic cap (at the top of the headset). Otherwise perfect, they took a real hammering on the dirt roads and we had no issues. 8/10. Very comfortable wrist angle, great control on dirt. We had to be inventive when installing the handlebar bag fittings though! 9/10. Great seat posts for Brookes saddles, where a setback is usually required. Well-designed adjusting mechanism for accurate seat tilt. 9/10. I had a B17, the girls bought the Imperials. All were perfect, although Di's took a while to break in. Best to use for a few months before a tour if possible. 9/10. Rims were great, but got a few broken spokes on some of the worst roads. Next time I'll get the 36 spoke option. 7/10. The Hope hubs are sealed and tough! 9/10". These tyres are quite heavy, but very puncture resistant, durable (we got over 14,000 kms on them), and handle all road conditions well. We got the folding version, and took one spare tyre for the four bikes, which we never used. 9/10. If you live in South Africa, the best (only?) place to get a range of good quality touring accessories is from Grant Freeman at Cycletouring. We got a lot of our stuff from him, competitive prices, good advice, super-efficient. Be aware that good quality touring accessories are expensive, but they will usually work out cheaper in the long run, and will tend not to let you down in the middle of some remote area. The Logo Evo is better than the Cargo as the bags are carried with a lower center of gravity. 9/10. Took a regular hammering with no ill effects. Can't feel the resistance, yet generates nice power for a powerful front light (always left on for visibility). 9/10". Was a great partner for the SON hub and generated fantastic light. Tough and waterproof. Good option. 9/10. Excellent visibility (even in daytime), great power (two rechargeable AA's = > 50 hours on flashing). Each light has three LED's (one big and two small). On two of our lights, the main LED fused after a few months. Maybe from the dirt roads? Would probably get them again however, as there are not many AA battery options out there. 7/10. These are genuinely unbreakable. Once a stick in the spokes caused the mudguard to concertina, and we just pulled it straight again, incredible. Bit fiddly to fit though. 9/10. We only got these a month or two into the trip, and found that they are definitely worth the cost and extra weight! Robust and ultra convenient. No problems, despite the Surly web site having some reservations about the use of kickstands on their frames. 9/10. Depending on what handle bars you have, different mirror options become available. For our Jones loop handlbars, these were perfect - light, effective, easy to adjust, unbreakable. 10/10. For road touring these are perfect, would give them 9/10. Off road, we picked up two problems (a) the panniers bottom fitting would unhook from the rack (so we would need to strap them to the racks), and (b) the bolts holding the plastic fitting part would sometimes come loose (eventually I replaced some of them with normal steel bolts). Fully waterproof and made of very strong material. 7/10. Strong, practical, does the job. Mounting on Jones Loop Bars requires some creativity. 8/10. Two of us took rackpacks, these are great if you need to carry more than can fit in your panniers. 8/10. Worth taking for a tour, gauge is very useful. Nice foot pump capability. Had to lube the cylinder a couple of times. 8/10. These can take the standard 1.5l plastic water bottles you get from the shop, and hold them in even on bumpy roads. Highly recommended for touring, especially in places where water could be in short supply. 9/10. We did a fair amount of camping and wild camping, and this meant we had to be fairly self-sufficient. Here are some of the important things to get right to be comfortable on a longer tour. Great lightweight mattresses (around 0.5kg), we found them really comfortable and nothing more than this is required unless you will be in very cold conditions. Got a puncture once, thanks to a monkey bite (long story) - but comes with a puncture repair kit that did the job well. Easy to pump using the Exped Schnozzel Pumpbag - great invention. 8/10. Very light (around 0.5kg), comfortable and perfect for summer conditions, but we struggled a bit in colder weather (say < 10 degrees Celcius). I would take a slightly heavier and warmer sleeping bag next time round. 6/10. Multi-fuel is the only option for travel in Africa. Lovely stove, works perfectly on Benzine (white spirits). Also works well with petrol, but petrol is a dirty fuel, so regular cleaning then required. Easy to dis-assemble for cleaning though. Good support from the supplier (ATG) who mailed us a replacement part free of charge (which we had broken). Would use it again. 8/10. We took a laptop, a kindle (which broke), a couple of iPads and a couple of smart phones. Depending on your needs, a smart phone and / or a mini-tablet will cater for most things. For charging devices, we overdid things a bit - we took a battery, a solar charger and also a little device called a "Sinewave Cycles Revolution Dynamo Charger", which could charge things from the dynamo hub. However our experience was that we could get to a power outlet every few days, so in future I would just take a battery from which I could recharge other devices (with a minimum capacity of 9,000 mAh), and leave all the rest. We also took a charger which could recharge rechargeable AA and AAA batteries. We needed these batteries for our rear lights, our torches and the Garmin. This was a great solution. The Garmin interfaces are terrible (in that they take a while to learn), but their hardware is great. Our GPSMap took a real battering including a 50km/hr tumble off the bike, but kept working all the way. Power consumption was good - two AA batteries would be enough for a full day's ride. The unit was handle-bar mounted, and gave excellent navigation and other travel stats (see pic). 8/10. Firstly, what works for one person won't always work for another, and many choices have pros and cons to trade off. Even within our family, we had different views on aspects that we liked or disliked about our selection of gear. And secondly - as Lance Armstrong once (now infamously) said: "It's not about the bike". We have met many cycle tourists over the last few years, enough to know that there is very little correlation between quality (and quantity) of gear, and quality of experience. We met a young Chinese couple who cycled from all the way from Shanghai to Cape Town (via the high mountains in Tibet), on a pair of cheap mountain bikes, carrying the heaviest loads we have ever seen on a cycle tourist, and who had the most amazing experiences ever. We also met an American guy with a fantastic bike, and who carried practically nothing at all (only two rear panniers' worth), who had an equally amazing experience. And we have met a good number of cycle tourists travelling "off the grid", with no cell phones, GPS or computers whatsoever. Copyright © 2017 Tegan Phillips.